Ethical Society -- north facade. The ground level view of the north elevation gives quite a different impression than the primary front (south) elevation does. Similarly, an overall view of the north elevation varies in feeling and impact from a closer, raking view at the ground floor level. 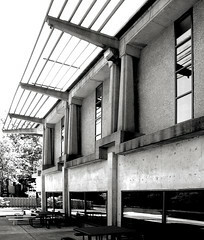 The glazing and concrete here differ from the rest of the building, either around the primary central pavilion or anywhere on the north and south wings. Photograph Andrew Raimist, October 2005. Inside the ground floor elevation is the Sunday school assembly and/or meeting room. When seated, users can't see much outside, like the parking lot. It may have been intended to help keep attention focused on the program, much like not being able to look out the windows in a church. As I remember, the windows above that are in a hallway behind the main hall, and are more or less unnecessary. They certainly brighten that hallway, and that hallway helps keep the main meeting room quiet. The wing on the East is classrooms,with natural light ONLY from the North. Thanks for the comments. It's helpful to understand the interior functions and uses in looking at the exterior of a building and you've described some of the reasons why it can be instructive.